1) St. George Pow Wow – June 1-2 – The mission of the Pow Wow is to create an environment and event that allows a variety of cultures and ethnicities to come together under one roof to celebrate their differences through song and dance. Admission: $3, open to the public. Located at Dixie Convention Center (1835 Convention Center Drive, St. George, UT). 2) Downtown Farmer’s Market – Every Saturday through October – The Downtown Farmers Market is a non-profit community project to promote the downtown area as well as promoting organic gardening and homemade crafts and goods. Admission: Free, 8AM – 12PM. Located in the Courtyard at Ancestor Square (Main Street and St. George Blvd, St. George, UT). 3) Outdoor Movie – June 8 – Starting at dusk, come and enjoy “Chronicles of Narnia” in the outdoors on a 14 by 20 foot screen. Come early and bring your lawn chairs, blankets and pillows. Pack a picnic style dinner or purchase snacks from the vendors sellling movie type treats. Spend a warm and enjoyable evening with the family! Free to the public, 5PM-10PM. Located at St. George Town Square, (Main Street between Tabernacle & 100 South, St. George, UT). 4) Concert in the Park – June 11 – Come enjoy a concert under the stars. This month’s concert is provided by 50′s and 60′s rock ‘n roll group: FLIPSIDE. Admission is free, 7:30PM-9:30PM. Located at Vernon Worthen park (400 E 200 South, St. George, UT). 5) WCBRA Barrel Race – June 13 and 25 – Located at the Washington County Regional Park, 6:30PM-10:00PM (5500 W 700 S, Hurricane, UT). 6) Southern Utah Outdoor Expo – June 15-17 – Outdoor expo and archery competition. Brought to you by True Flight Archery and Pro Shop LLC. Admission: $5, open to the public. Located at Dixie Convention Center (1835 Convention Center Drive, St. George, UT). 7) Outdoor Movie – June 22 – This week, come and enjoy “Sandlot II” on a 14 by 20 foot outdoor screen in the park. Be sure to arrive early to get the best spots and bring your lawn chairs, blankets, pillows and PJ’s. Pack a picnic style dinner or purchase snacks from the vendors sellling movie type treats. It’s a great outdoor activity for the whole family! Free to the public, 5PM-10PM. Located at St. George Town Square, (Main Street between Tabernacle & 100 South, St. George, UT). You love your pet. For most of us, pets are like family. No, they are family. That’s why the thought of leaving your “child” home with a stranger while you travel is unthinkable. Like the St. George Ramada Inn, many hotels and lodging establishments are realizing that more and more people are traveling with their pets and have adopted pet-friendly policies to help make your travels with your pet more comfortable and less stressful. From budget inns and transient hotels that have standard pet-friendly rooms for no charge or a nominal fee to upscale resorts with pet suites featuring pooch cots, food and water dishes, treats and toys, the options are as diverse as the places to which you travel. While the number of hotels that allow pets is increasing, no two establishments are the same and policies can vary greatly. There are also still many lodges that do not accept pets. If you’re planning on traveling with Fido, it’s important to know before you go. Whether you book your stay online, make a reservation over the phone, or just stop in while rolling through town, you should always call the hotel ahead of time and find out exactly what their policies are, what (if any) pet amenities are included, and make sure they have a pet-friendly room available for your stay. Even if a hotel advertises itself as a pet-friendly property, there are almost always terms that can affect your travels, and even result in you arriving without a room for you and your pet. Some of these terms and policies are: varying pet fees and deposits, size and weight restrictions, number of animals per room, types of animals and breeds that are and aren’t accepted, and a limited number of pet-friendly rooms. The Ramada St. George is a pet-friendly hotel, and we’re happy to have you travel with your furry family member. However, we do have certain pet policies and restrictions. For instance, we allow one pet per room (with some exceptions), under 25 pounds, for a $15/night non-refundable pet fee. For safety and sanitation reasons, pets cannot be left unattended in the room and are prohibited in certain areas of the hotel (such as the pool, breakfast and common areas). Also, for the safety and comfort of our guests, we only have a total of four specific pet-friendly rooms. Once those are occupied, we cannot accept any more pets. Properly licensed and documented service animals are of course always welcome in any of our rooms. Traveling with a pet is stressful, for both the animal and the owner. Calling ahead and knowing specifically what your destination hotel’s policies are will help ensure you have proper, comfortable and safe accommodations for you and your pet. P.S. Thank you Regal Bet Red (a.k.a. “Red”) for posing for this article’s picture. Red is a rescued brindle greyhound. If you’re like most travelers, one thing that’s important to you is sticking to a budget while you’re away from home. As this is a Ramada St. George Thrifty Traveler feature post, I’m about to help you do just that by utilizing something you probably already use every day. It’s called social networking, and it’s easier than you think to use it to your advantage when it comes to pinching pennies. Facebook, Twitter, Yelp, Foursquare, TripAdvisor, Google+, and now Pinterest. These are just a few websites with one common purpose; to be social. Believe it or not, these services aren’t just for posting the latest pictures of your grandchildren, sharing embarrassing moments that happened to you at work, or passing along a quote from the morning news. Businesses down the block and across the world are becoming part of the global phenomenon known as social media, encouraging communication between businesses and consumers like you. So what does this mean as a budget-conscious traveler? You need to like, follow, favorite, check-in to, and pin the places and businesses in your hometown as well as those in any city to which you are planning on traveling. Why? Chances are those businesses and places are not only carrying on a dialogue between consumers and tourists (a great way to find out what to expect when you arrive), but they’re likely running contests, promotions, special discounts, showcasing specific menu items or products on sale, and other great ways to save on the things you’re going to buy anyway (or wish you could treat yourself to while on vacation). Check out StGeorgeUtah.com’s Facebook timeline. It’s full of 50% or more discount offers for golfing, spa packages, tanning, bakery goodies, meals and more in St. George. Services like Foursquare and Yelp regularly have exclusive discounts and promotions that you can claim when you “check in” to places on your smartphone (such as Buy 1 Get 1 Free at restaurants and coffee shops, or 15%+ discounts at hotels and other service providers). How do you find and take advantage of the savings opportunities available? Simple. Just do a search for businesses and places in your area from within the website or application. If you’re using a smartphone or tablet, most social apps (like Facebook and Google Check-In, Yelp and Foursquare) can detect your location and automatically find businesses around you that offer discounts and promotions, along with customer reviews so you can pick the best ones that fit your needs. And because these networks are meant to be social, they usually will show you related businesses and services based on your searches and interests, making it even easier to find the best specials and most savings. By spending time a little differently on sites you’re already using you can easily find new ways to save big on your next trip across the country, or across the street. So venture out in the digital world and get social! While you’re at it, be sure to like us on Facebook. As a special thank you, you’ll instantly get a printable voucher to save 15% on your next stay with us. We’re also regularly running contests for free night stays, sharing information about great local events and deals, and keeping everyone updated about the goings-on at the St. George Ramada. Twist the Night Away is back in Southern Utah! It is a production from the 50′s, based in Branson, MO. “Re-live the music of the 1950′s as we Rock Around the Clock with the Everly Brothers, Jerry Lee Lewis, Patsy Cline and Elvis just to name a few. This cast will take you back to the era of rich harmonies, classic love songs and unforgettable dances that will leave you wanting to Twist the Night Away!” Tickets are $17.50 at the door, but if you book through the Ramada Inn, they are only $15!! When you come to stay in St George, you often quickly ask yourself, what are the best things to do in St George? In truth there is so much to do here, so many places to see, so many things to experience. And one of them is a very popular, and only getting more so sport of rock climbing. There are some great places to go rock climbing in St George, so if you’re looking for things to do in southern Utah, do some rock climbing. In truth rock climbing can be a slightly expensive hobby and while you are taking time to save money to buy all the necessary gear and equipment, you could prepare yourself physically. This will ensure your safety as you begin to climb. 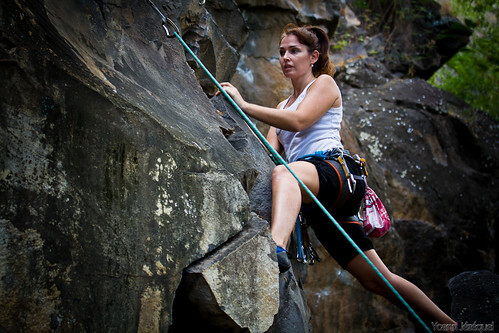 It is important that you are fit enough before you embark into rock climbing. This sport shall challenges your physical capabilities and strength along with your mind and spirit so you have to make sure you are physically ready so you may fully enjoy this type of sport. 1. Prepare your heart and your lungs. You will need to perform aerobic exercises to strengthen your heart and lungs to keep up with the demands of a continuously difficult activity. Aerobic exercises are trainings to make your heart and lungs to become more efficient. These aerobic exercises include running and swimming among many others. You will need a few months to fully prepare your body before a climb. You have to exercise at least thrice a week for about 30-60 minutes for every session. You keep a record of your heart rate before and after your exercises. When you heart rate decreases with the same amount of exercise, it would mean that your heart is getting more efficient. 2. Strengthen your leg muscles. Running is the best way to strengthen your leg muscles. As your legs get accustomed to the exercise, intensify your exercise by running on inclined or steep surfaces to get your legs familiarized and get used to moving from place to place as rock climbing does require lots of movement at an angle that your body is not accustomed to do. 3. Go to a climbing gym. What you can do to see if you are ready for the big climb is to actually climb. You may hit an indoor climbing gym and see how you cope up with the rigors of this training. If you see that you are ready, you may set yourself up to climb. Mountains consist of many slopes which would help condition your muscles as you move from place to place like what you do in hiking. More importantly, your muscle groups will likewise be conditioned especially which is actually helpful in lifting your body in an ascent. It would help to join a mountaineering climb group that’s doing training climbs. Not only will these trainings get your lungs more accustomed to thinner air when you are in high altitudes, it also helps condition your brain to proper coordination of your hand and leg movements as well as prepare your mental alertness. In doing training climb, you could see how ready you are physically. When you find yourself gasping after a few minutes of ascent, then you will need to exercise more. You should climb at least once a month to get you fully prepared for climbing. 4. Don’t eat before you climb. Before the climb, you should not get used to filling up your stomach as this will not help but will just stress the gastro intestinal system and revert from your accomplishments. 5. Increase your carb intake. You may try to increase your carbohydrate intakes which would help you store glycogen in your muscles. You need to eat more of the foods containing low glycemic indices as they can help increase your short term energy storage but avoiding increasing your blood glucose level. 6. If you have medical conditions. For those having certain medical conditions such as heart disease, asthma, hypertension and diabetes, it is essential that your doctor is aware of this and that he allows you to climb. He would most likely advise you what you should do, what medications to prepare before going for the climb. If you have problems with your muscles, bones, tendon or just recovering from a sports related injury, you should see your orthopedic surgeon for pieces of advice. As you are given time to prepare financially, you should choose the proper gear. You will need a bag specifically appropriate for rock climbing in St George. Do not forget the shoes as this is one of the most important parts of your gear. Make sure it fits you perfectly; not too snug. If your shoes do not fit your feet really well, it could cause you to make necessary adjustments that will require more energy causing the climb to become more difficult. Everyone could employ different strategies how you could prepare for a climb. There is actually no right or wrong for as long as you train physically to get you ready for the next climb. Aim for the top and get to enjoy the view from there. So again when looking for lodging in St George, and things to do when you come here take a look at rock climbing.